YES, It’s time for the playoffs. I haven’t posted here in two years now (Twitter is where it’s happening now. Kind of) but this blog is still alive. Kind of. So yes: SHARKS! I decided to keep my almost annual tradition of jinxing San Jose by picking them to win the cup. Which means they’re probably gonna lose to LA in the first round. Sorry, Sharks. I could see the Habs beat Tampa, but unfortunately, as much as it pains me, I don’t think a Therrien-led habs team can beat the Bruins. I mean probably not this time. I think the Rangers could beat both the Flyers and the Pens. They’re my darkhorse in the East. In the West, I know having both Chicago and LA out in the first round would be a surprise, but both their opponents are really good too. I think St Louis will find a way to get out of their slump and do some damage. I can’t pick them to win it all though. I don’t know how I would feel about this. I LOVED when Jaro was there, because it was the perfect situation: a player I love on a team, I really like, and it looked like it could be their year. So the trade really annoyed me. I’m not sure how I feel about them. I still like them, but I’m a bit mad at them for trading him, and it would really be bittersweet to see them raise the cup with Ryan Miller. In any case… Go habs go! 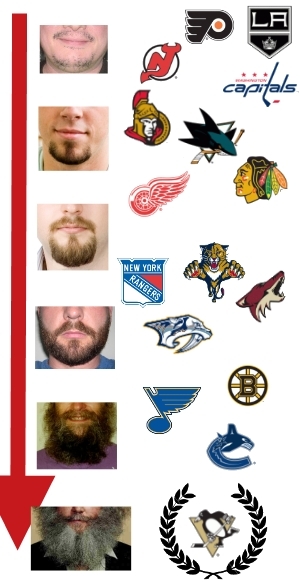 2012 Playoffs: Beard-o-meter, edition 4! Well, this blog is as dead as the habs 2012 season. 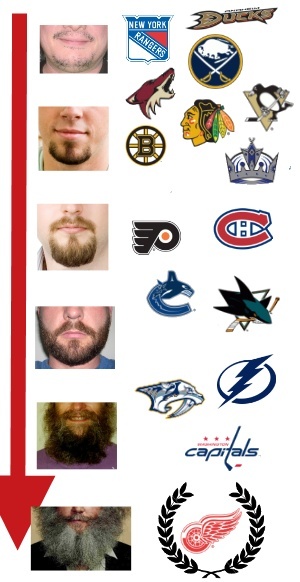 But there’s one thing I still like to post every year: my silly playoffs beard-o-meter. The Pens! Yes, crazy uh? That wouldn’t be a huge surprise, seeing their lineup, but yeah.I tried to pick a few upsets, but I couldn’t really see a real cinderella like Tampa last season. In the East, I picked the Panthers over the Devils, mostly because I didn’t see a lot of people giving them a chance and because the devils have really sucked in the playoffs over the last few years. No other real surprise in the first round. but I think the Sens actually have a good chance against NY. In the West, I decided to be a little bolder and I picked the coyotes over the Hawks and the Preds over the Wings. Those would not be huge upsets, but still. I hope the Blues can get as far as I predicted here, but unfortunately, I don’t think they can get much further. Hopefully they prove me wrong. And in the SCF, I just can’t see the Canucks beating the Pens, so there you go! 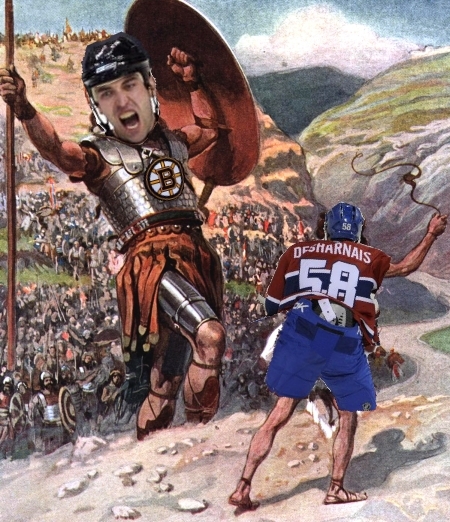 Now let the habs-less playoffs start! Let’s go Blues! 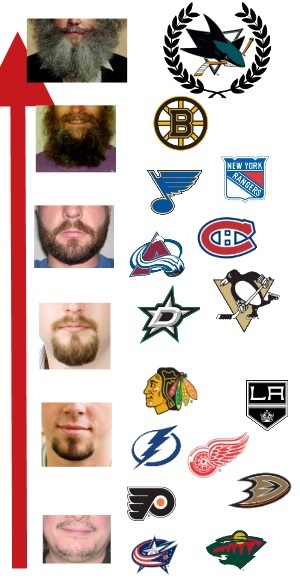 Tagged with Beard-o-meter, NHL Playoffs! Anyone here? Eww, it smells like no one opened the windows in about 3 months here. Ahem. Yeah. Lets be honest, this blog is as good as dead. I have less time to do silly photoshops, and honestly, I discovered I liked tweeting just as much as blogging. Sure it’s nice to take the time to craft a nice little post, and to develop your thoughts in more than just 140 characters, but I like that twitter still allows me to vent after a loss, rejoice after a win (which was my main goal when I started this blog), be snarky or whatever, and if my tweet is well written, it’ll get a response right away. AND above all, it’s just as efficient (or even more actually) to procrastinate! But anyway, I decided not to officially close this place, and I think I’ll just come back here from time to time, if I want to. Yeah, I told you it was simple. Anyway, here are my official predictions for the 2011 nhl playoffs! Yup. I picked the Red Wings. So you can take it to the bank: they have no chance. I successfully jinxed the Sharks two years in a row, and this time, it’s the Red Wings’ turn. I picked the Preds as my “random team that decides to mess everyone’s predictions and reach the Conference finals” in the West. I could see Tampa doing the same in the East. Mostly because they have Coach with them, so really, they have to win at least two rounds. I had to pick Montreal over Boston. And I really wanted to pick Buffalo over Philly, but that meant too many upsets in the first round, so I went with the Flyers. I think the Caps are much better suited for the playoffs than last year. And I don’t think Vancouver will win it all. That’s the President’s trophy curse. So there you go! Like every hab fan with a blog today, I feel like I need to post something because it’s a special day. The Ducks are in town, and with them, many familiar faces are making their return to Montreal. First, I want to mention the two that will likely be forgotten tonight: Chips and Paul Mara. Paul Mara is kind of easy to forget. He was injured most of last season, and he didn’t get to show us his wonderful facial hair during the playoffs. But I wanted him to have success here, so I’m happy he’s playing more in Anaheim this season. Lapierre. Well honestly, I don’t really miss you at all. You were kind of good, sometimes downright hilarious with your crazy faces. But I can’t forget the bad penalties and the embarrassing moments either. I was never a huge fan of yours. I hope you’re doing well now, but honestly, I don’t really care. And that leaves us with the real important one. There’s no need to say much here, everyone else will probably say much better than I ever could what this guy meant to Montreal. 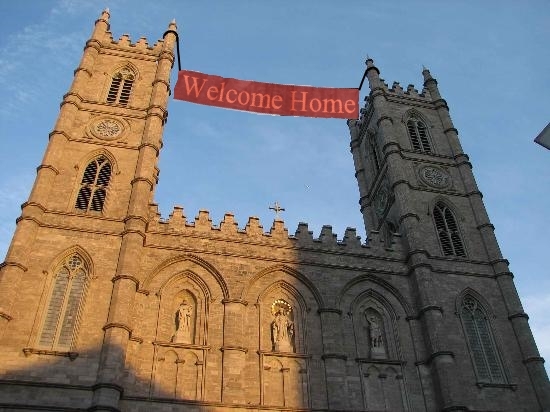 I’m not a Montrealer, but even for me he meant a lot, and yeah, I still miss him. Fans in the bell centre tonight better give him a freaking awesome ovation. 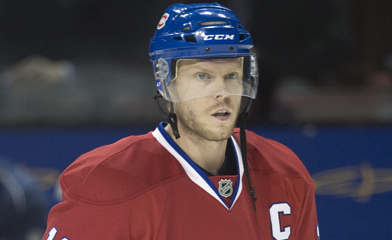 You’ll always look better in bleu-blanc-rouge, Saku. But yeah Trevor Timmins, I don’t want to tell you how to do your job, but could you please note this name on a post-it and keep it on your desk for the next 8 years, just in case? Thankyouverymuch. And finally, on a different note, I haven’t had time to say it here, but I wish you all a fabulous year, with lots of fun (which might not be hockey related), success and happiness (which will probably not be hockey related…)!